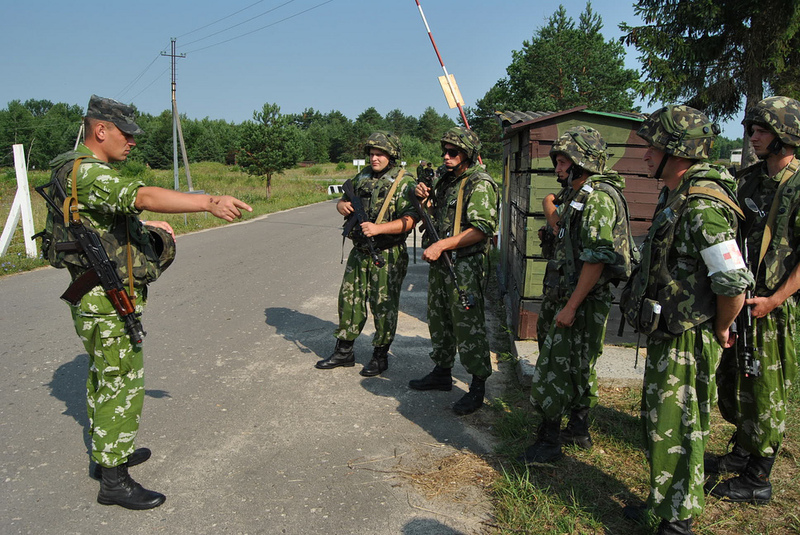 A Ukrainian Army officer, left, gives instructions to his soldiers before conducting training in Yavoriv, Ukraine, July 10, 2013.
only four Ukrainian combat vessels are combat ready. It is unclear what state the Ukrainian armed forces are now in after an intense year of civil war. Western governments have pledged non-lethal aid in the form of medical supplies, body armour, blankets and field rations. Following the quirky nature of the charity text-message campaign however, the People's Project has emerged and is crowd-sourcing various military endeavours from medical supplies, money to personnel and semi-autonomous combat vehicles. The People's Project — a crowdfunding website founded by David Arakhania, an IT executive from Kiev — posted a depiction of the recently unveiled Russian Platform-M drone tank as their fundraising campaign feature photo. (As of March 17, 2015, 149 individuals have donated almost US$9,000 towards the tank’s purchase.) Obviously, it is a bit misleading as the Platform-M has four grenade launchers and a Kalashnikov rifle and is not an awkward robot that resembles a scale version of an unarmed British Mark V tank. This is probably the first Kickstarter defence initiative, and yet wider questions have not been asked. The People's Project has brought in hundreds of thousands of dollars for their campaigns so far. If a government can't procure weapons or military from its allies, why not approach individual people using a social media campaign? If crowdfunding military procurement (lethal or not) becomes a trend, then this should be worrying. Take the example of Syria. There have been many questions as to what the Free Syrian Army represents as it is a coalition of many groups and factions. It is not clear what their future aims for the country are, or if the coalition will collapse after the overthrow of President Bashar al-Assad's regime and ISIS. This did happen in Libya after the overthrow of Colonel Moammar Gadhafi's regime and continues to be a security issue for the region. Now, let's imagine a Free Syrian Army Kickstarter campaign. The United States is prepared to train the rebels, but they go online and suggest that they do not have enough money for weapons and supplies. We know that they are integral for the removal of ISIS in the region and there have been suspicions that the Assad regime has carried out chemical weapons attacks and other atrocities against its citizens. The money starts pouring in, but who does it go to? What happens if some of that equipment goes to a certain faction of the rebel alliance and that faction pledges allegiance to ISIS? It is doubtful that individual citizens will be charged with providing financial support to a terrorist organisation, but it does raise hypothetical issues. Some insurgent groups already raise funds through fundraising activities. The political arm of Lashkar-e-Taiba (also known as Army of the Righteous, a Kashmir-focused terrorist group in Pakistan) has been known to raise money through jars situated on business counters like a UNICEF box would. It could be conceivable that the political or humanitarian wing of an insurgent or terrorist group could fundraise through the Internet in the future. There is hope though as governments already impose economic sanctions on these groups. But as technology improves and so does the Internet and Internet financing, the security services will have to keep up. The U.S. has enacted several codes of law concerning prohibitions against the financing of terrorism, but there is always the risk of groups getting around that. It is not only the security services that will have to be vigilant, but especially financial institutions. Visa, MasterCard, Bank of America and PayPal all blocked the donations to WikiLeaks, but only after WikiLeaks became a national security concern that gained international notoriety. It may seem funny and interesting that the Free Syrian Army has a tradition of do-it-yourself procurement projects and that crowdfunding is becoming a way to finance the Ukrainian military, but there are impending security concerns that need to be taken into account. If not, crowd-funded insurgent or authoritarian government activities could become a reality.